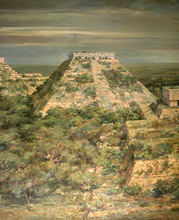 Large, painted mural of Uxmal by Carlos Vierra (1873-1937). This is 1 of 6 murals of Maya cities commissioned from Vierra for the 1915 Panama-California Exposition in San Diego. Reproduced from 35mm slides taken May 2000 directly from the mural on an interior wall of the Museum of Man, Balboa Park, San Diego. Click images below to enlarge. Images will open in new windows. You may open two or more images for comparisons. 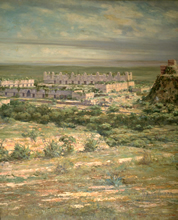 Carlos Vierra, View of Uxmal from the Pyramid of the Old Woman; mural painting for the 1915 Panama-California Exposition, San Diego. 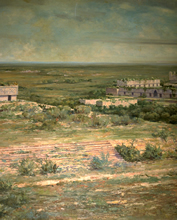 Governor's Palace, Uxmal; detail of mural painting by Carlos Vierra. Signature of Carlos Vierra; lower-right corner of mural painting of Uxmal. South Temple, Uxmal; detail of mural painting by Carlos Vierra. 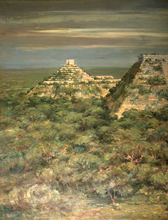 Great Pyramid, Uxmal; detail of mural painting by Carlos Vierra. 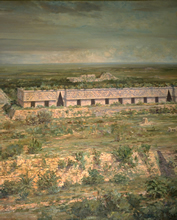 Governor's Platform, Ballcourt, and Nunnery, Uxmal; detail of mural painting by Carlos Vierra. Nunnery, Uxmal; detail of mural painting by Carlos Vierra. Pyramid of the Magician, Uxmal; detail of mural painting by Carlos Vierra.